You’d never know that Eleni Kounalakis was taking an oath of office for an afterthought of a job that has been occupied by men who generally become answers to political trivia questions. As U.S. House Speaker Nancy Pelosi, four other members of Congress and numerous legislators looked on, Gov. 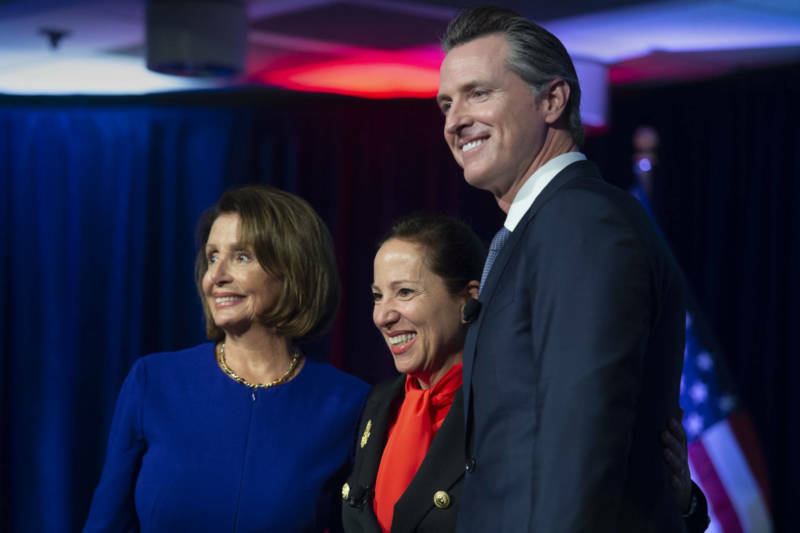 Gavin Newsom swore Kounalakis in as California’s 50th lieutenant governor on Monday — the first woman to be elected as governor in waiting. Former Michigan Gov. Jennifer Granholm served as master of ceremonies for the event in a packed Sacramento Public Library auditorium that bears the name of Kounalakis’ father, developer Angelo Tsakopoulos. No governor in recent memory had sworn in a lieutenant governor. In fact, most governors look upon lieutenant governors as upstarts to be kept at arm’s length. Governors and California’s independently elected lieutenant governors “don’t always see eye to eye,” Newsom noted. “That’s about to change,” Newsom said. Exactly what duties Newsom might cede to Kounalakis remain to determined. There was no promise. As “lite guv,” Kounalakis’ duties — at least when Newsom is around — are limited to serving as a University of California regent, a California State University trustee, a member of the State Lands Commission, which has oversight over beaches and offshore oil drilling, and presiding over the hazily defined and sporadically funded California Commission for Economic Development. She also will be acting governor when the governor leaves the state. Newsom quipped that she should not “start appointing judges,” a reference to Mike Curb, who was lieutenant governor when Jerry Brown was governor the first time and attempted to fill judicial openings. Once in 2013, when a mother and her son asked Newsom to pose with them for a photo, the boy asked him what a lieutenant governor does. “I ask myself that every day,” the lite guv replied. But clearly Newsom made the most of the post, and over the years came to see it more generously. 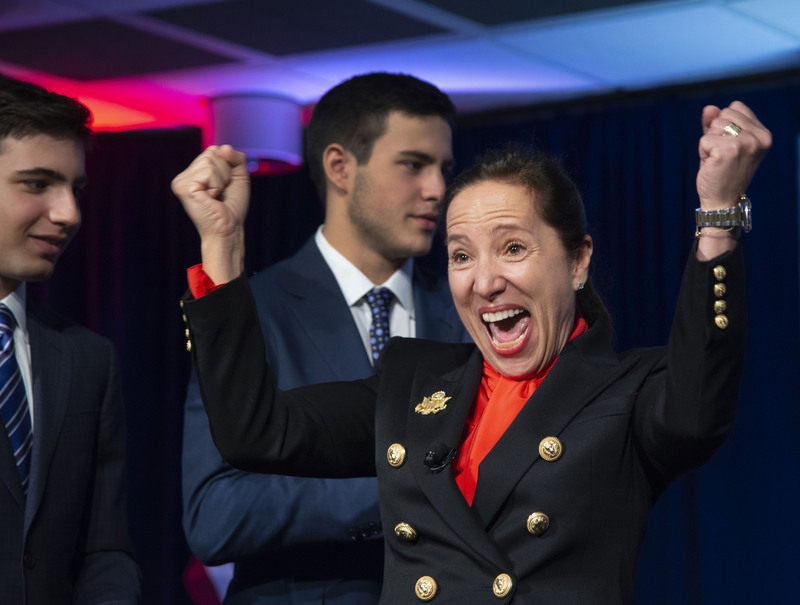 And Kounalakis, a longtime Democratic activist and fundraiser, campaigned hard for it, pumping $9 million of her own money into her campaign, besides an independent expenditure of more than $5 million by her father and other major donors. “It ain’t such a bad job,” Newsom said on Monday. Kounalakis, 52, was U.S. ambassador to Hungary under President Barack Obama. She defeated Democratic state Sen. Ed Hernandez with 56.6 percent of the vote in November. Kounalakis paid homage to her father, who arrived in Lodi from Greece at age 14 not speaking English, worked his way through Sacramento State College and became a major developer, a Democratic donor and a philanthropist. He sat in the front row as she took the oath. Kounalakis vowed to block any attempts to expand offshore oil drilling, and work to expand access to public universities, calling it the “the best way to address our rapidly changing digital economy.” UC President Janet Napolitano was in the audience. In 1999, former Gov. Davis took umbrage at one of the early actions of then Lt. Gov. Cruz Bustamante. Bustamante’s staff suddenly lost preferred parking privileges, though Davis’ staff at the time called it mere coincidence. “Pay no attention to the critics who say the job has no influence,” Davis said when asked what advice he would offer to Kounalakis. Davis suggested that she use her position as a UC regent and CSU trustee and work at each campus to “help solve their problems.” In most cities, Davis noted, the colleges are the most important economic engines where they’re located. Students, faculty, administrators, university donors and alumni vote. That can be useful for, say, a future political campaign.